By the year 2050, nearly 70% of the global population is expected to live in urban areas. That fact alone should be enough to explain the urgency of SDG 11: Sustainable Cities and Communities and achieving the SDG 11 indicators. With the population of the world expected to be near 10 billion people by then, that means nearly 7 billion people will be living in urban environments. So if we think there are infrastructure issues now, we may be headed towards much worse. The Sustainable Development Goals are of course meant to define and tackle the world’s greatest challenges. Crowded urban environments are a catalyst for many of these issues, from health to sanitation, housing to the environment. So, how are we doing in tackling this fundamental goal? Inclusivity focuses on the problem of inequality that tends to be associated with (if not exacerbated by) urban economic systems and infrastructure to varying degrees. Greater access to basic services, such as healthcare, is a key marker of an inclusive urban environment. Urban safety, or lack thereof, has long been correlated with poverty rates (and inequality), where the higher the instances of poverty the less safe an area tends to be. Efficient and accessible transportation is another essential characteristic of a safe urban community. Resiliency refers to the ability of crowded urban spaces to plan for and respond to things like large scale disasters (higher population density means any natural or man-made disaster could potentially affect more total people). Disaster mitigation strategies, response plans, sound infrastructure planning -- these are all necessary for resilient cities. The sustainability theme highlights the need for good resource management and urges a focus on renewable sources of energy. Disseminating resources (e.g. electricity) to so many people in a crowded city is a huge challenge, as is the management of the huge footprint of that population (today, 75% of the world’s carbon emissions originate in cities!). Below are a few of the specific SDG 11 targets and SDG indicators as defined by the United Nations. What does it mean for a city to be sustainable? It’s clear that cities will need to lead the way when it comes to making progress on any of the SDGs. Some cities have already made immense strides to become the example for others to follow. 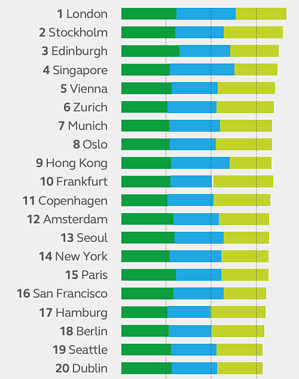 Every year, consultancy firm Arcadis releases a list of the world’s most sustainable cities according to their sustainable cities index. This year, they focused their ranking on how well cities respond to the needs of inhabitants in terms of social, environmental, and economic factors. Topping the list were London, Stockholm, and Edinburgh. You can see the top 20 in image, where green represents social factors, blue is environment, and yellow is economic. What is it that London does so well? First of all, it scores well in social and economic areas (a healthy and thriving business ecosystem is a key driver of sustainability), and fairly high in environmental as well. In fact, London aims to be the first city in the world with more than half of its area consisting of green and blue spaces. London sustainability goals also include making the city a net zero carbon urban environment by the year 2050. They have already made significant progress towards this goal. Resiliency, which we mentioned above, is also being tackled through various adaptation strategies for potential disasters. The reason it sits atop the list is because it has adopted a balanced approach to sustainability, understanding the systemic strategies needed to ensure that 9 million people can thrive while also reducing the environmental impact of that considerable human presence. According to the SDG Index & Dashboards Report, no country in the world has completely achieved the targets set forth in SDG 11. As we can see, more progress has been made in developed regions, such as North American and Europe, while much of Africa is stuck with major challenges to overcome. 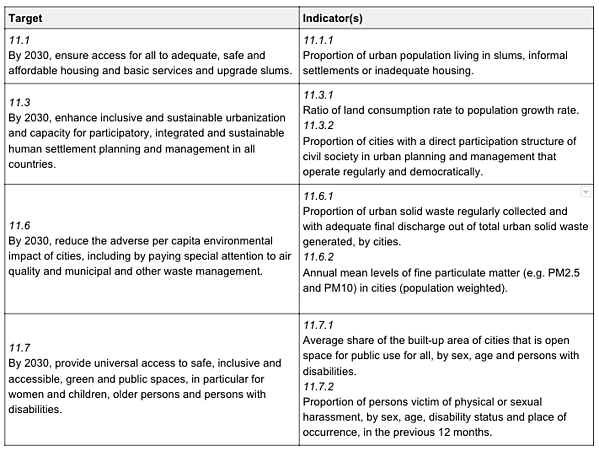 If we look specifically at the first SDG 11 target and indicator, which calls for housing, basic services and the general betterment of living conditions in urban slums, a UN report tells us that there was a 5% decrease in the percentage of global population living in slums. However, absolute population numbers of slum residents did increase, pointing to the difficulty of addressing this problem considering the population growth rate in this areas. Further data from that report tell us that “91 per cent of the urban population still breathed air that did not meet the WHO’s Air Quality Guidelines value for particulate matter.” That is a staggering number, no matter how you look at it. On a brighter note, approximately 75% of the solid waste generated by cities around the world is being collected and managed. Processes to create a circular economy management of such materials is still a distant reality, but as the collection numbers rise better processing systems can also be implemented. Every aspect of SDG 11, when you really examine implementation needs and barriers, calls for corresponding technological solutions. The United Nations shares this view, emphasizing that creating sustainable cities and communities will require the best of the best information and communication technologies (there is also a free online course offered by the SDG Academy on the subject). Sopact also offers a technological, cloud-based solution that can support tackling SDG 11 (and others). Aligning the needs of this SDG 11 with the right technology means finding better ways to house and manage data. It means finding better ways for city leaders to collect information, house data, analyze data, and collaborate across these working areas with local and non-local stakeholders. This is what Sopact's technology was built to do: make end-to-end impact management more efficient for actors at all levels of decision-making. The overview of SDG 11: Sustainable Cities and Communities in some respects conveys a bright picture of progress. London and dozens of other cities have made considerable progress, and are stimulating economic success while doing so. But global challenges remain, exacerbated by exponential rates of population growth. And yet, if we as a global community make urban centers an increasing focus of efforts to achieve the Sustainable Development Goals, the future will most certainly be brighter, healthier, and more sustainable for all.